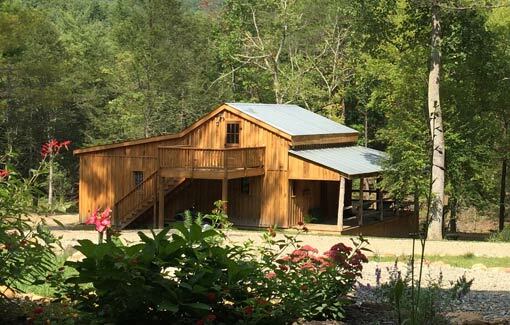 Mountain Shepherd Adventure School is located in the Blue Ridge Mountains of Craig County, Virginia. 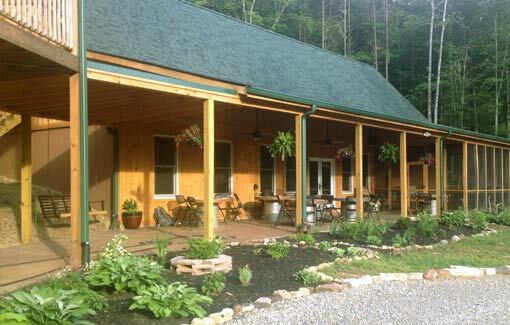 The facility sits on a secluded 100 acres, bordering the Jefferson National Forest with the Appalachian Trail nearby. The property features a series of wooded trails that follow and cross the creeks and streams, several outdoor classrooms and campsites, and a spring-fed pond. Visitors and participants enjoy majestic mountain views and the silence of the backcountry. Continue reading to discover more about our indoor and outdoor spaces! Inside of Mountain Shepherd’s 4000-square-foot modern-rustic lodge you’ll find the perfect spaces for resting after a long day of learning, holding a conference with your corporate team, or hosting a workshop or private event! 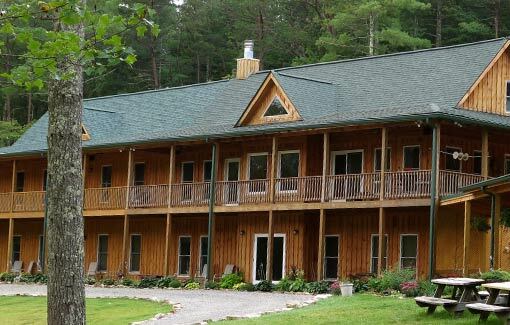 Accommodations in the Lodge include rooms that sleep 4, 8, or 10 people each, and private bathrooms. The Lodge sleeps up to 46 people total, and faces our pond and the neighboring mountains for stunning views. To book a private room (sleeps 1-4) or a bunk room (sleeps 8 or 10) in the Lodge, check out our AirBnB listing here. The Pub is the ultimate gathering space for course participants and registered guests. Our courses often kick-off and wrap-up in the pub, and you’ll find fellow adventurers there socializing over coffee and drinks during breaks and evenings. The building features a commercial kitchen for catered events and the indoor dining area seats about 100 people. There are also several tables on the garden patio, and a couple within our screened porch. While in the pub, visit the Mountain Shepherd store! Shop early…Shop often! We are authorized dealers for brands like Kelty, Buck Knives, ENO: Eagles Nest Outfitters, Mountain House, Darn Tough, Ultimate Survival Technologies, Honey Stinger, and more. After your course, stock up on some of the gear used and recommended by our instructors, and don’t forget the souvenirs! We have Mountain Shepherd survival kits, hats and t-shirts, plus paracord survival bracelets in a color to match every outfit. The Cabin at Mountain Shepherd is the perfect spot for a cozy, private retreat. The rustic space sleeps up to 7-8 people total, with 2-3 in the common area, up to 2 in the master bedroom, and 3 in the loft. A private bathroom, small refrigerator, gas fireplace, and snuggly sitting area complete the indoor space, but guests most enjoy the wrap-around porch overlooking the pond for outdoor relaxation! For more information and to book your stay in the Cabin, check out our AirBnB listing here. 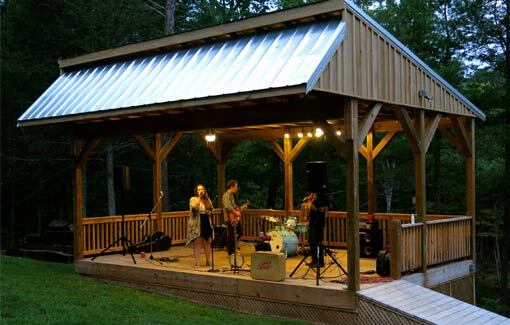 The outdoor stage is Mountain Shepherd’s own unique multi-purpose space! The acoustics are excellent and the grassy lawn is perfect for a summertime concert. The stage also hosts our courses from time to time, serving as a covered outdoor classroom close to the Lodge. Sometimes the stage even becomes a yoga studio, crafting corner, or talent show space, depending on who’s adventuring at Mountain Shepherd that week! This space is also available for use as a part of private events. Are you looking for an indoor/outdoor venue for a private event, corporate retreat, small wedding, reunion, birthday party, or other celebration? Do you need overnight accommodations for group while in the area for a festival or sporting event? Mountain Shepherd’s facilities are available! Contact Dina via email at Dina@mountainshepherd.com for more information, and check out The Lodge and The Cabin on AirBnB for lodging options and availability. re, on the right. Our sign is tilted a bit in the other direction. Our property is lined with a brown wooden fence. Take the left on Hemlock Ridge Lane and stay straight through the red gates. Get a bit of momentum heading up the hill. Parking area is at the bottom of the circle driveway.